Canon 70D Experience is a PDF e-book user's guide to help you learn to use your EOS 70D to its full potential. This is the PDF version. EPUB version is also available. 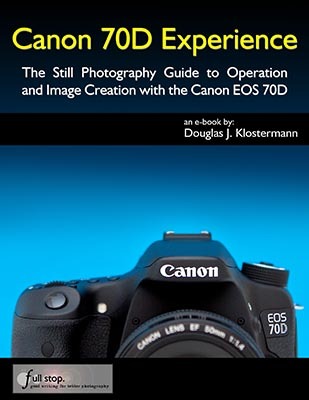 Canon 70D Experience - The Still Photography Guide to Operation and Image Creation (PDF Version) is an e-book user's guide that goes beyond the manual to help you learn the features, settings, and controls of this sophisticated and powerful camera, plus when and why to use them in your photography. Written in the clear and concise manner of all Full Stop guides, Canon 70D Experience can help you learn to use your EOS 70 quickly and competently, to create the types of images you desire.